A 47-year-old man presented to our outpatient clinic, preoccupied with hoarding of digital pictures, which severely interfered with his daily functioning. He was formerly diagnosed with autism and hoarding of tactile objects. As of yet, digital hoarding has not been described in the literature. With this case report, we would like to introduce ‘digital hoarding’ as a new subtype of hoarding disorder. We conclude with differential diagnostic considerations and suggestions for treatment. With increasing technological innovation and unlimited possibilities for digital storage, a new subtype of hoarding may have arisen, ‘digital hoarding’. Digital hoarding is the accumulation of digital files to the point of loss of perspective, which eventually results in stress and disorganisation. Although digital hoarding does not interfere with cluttering of living spaces, it has an immense impact on daily life functioning. Although no scientific papers have been published on this subject, the problem is frequently described on the internet by patients and by professionals. Recently, hoarding disorder has been documented as a separate disorder in the fifth edition of the Diagnostic and Statistical Manual of Mental Disorders (DSM-5).1 The specific phenomenology and development of hoarding justified a classification separate from obsessive-compulsive disorder (OCD).2 Hoarding disorder is defined as the extensive collection of objects followed by difficulty discarding them for aesthetic reasons, or because of an object's emotional value or consideration of its possible usefulness in the future.3 The consequence of hoarding objects is accumulation of objects in living spaces, leading to limited space, poor hygiene and feelings of embarrassment.4 We describe the first case of digital hoarding, based on a patient who presented to our outpatient clinic. A 47-year-old man was referred to our outpatient clinic with a request to treat his hoarding behaviour. The referral was made by his attending psychiatric nurse from an institution specialised in the treatment of autism, who helped the patient with structuring his daily life. In 2007, the patient was diagnosed with an autism spectrum disorder (ASD) in combination with traits of attention deficit disorder (ADD). Furthermore, he was known to have recurrent depressive episodes since 1994, for which he was being treated with venlafaxine 150 mg daily. His object hoarding gradually started when he was a university student, followed by progressive worsening over the years. He had never sought treatment for his object hoarding before presentation to our outpatient clinic. The patient mainly hoarded objects with limited or no economic value, such as paperwork and bike components. He had difficulty discarding these objects and felt comfortable surrounded by them. He believed they would be of use to him in the future. The accumulation of these objects led to severe cluttering of his house (figure 1). Owing to his object hoarding, the patient felt embarrassed to invite people over. The patient also hoarded digital pictures, which started 5 years earlier when he obtained a digital camera. Digital photography was his main daytime activity; he took up to 1000 images every day, mainly of landscapes. He had difficulty discarding these pictures, even though many were very similar, because they brought back memories. As with his objects, the patient felt attached to his digital pictures. He had four external hard drives containing the original pictures and four external hard drives containing backups. He never used or looked at the pictures he had saved, but was convinced that they would be of use in the future. He planned to merge pictures when new technologies would become available and thought some pictures would be suitable for future publication. The patient indicated that organising the large amount of digital pictures caused feelings of frustration and was very time-consuming, taking 3–5 h a day on average. It interfered with his sleeping pattern and kept him from other activities such as cleaning his house, going outside and relaxing. The patient was not married, had no children and was unemployed. He lived on an allowance. He lived by himself in an apartment in the city. He had a fairly good relationship with his father and had two good friends. Two aunts on his mother’s side of the family also expressed hoarding behaviour. Mental status examination revealed an unshaved and casually dressed man. His attitude was friendly and enthusiastic. He presented his case in a rigid way and had a short attention span. However, he was oriented and there were no memory deficits. There were no delusions or hallucinations. He did not have obsessions or compulsions. His mood was normal and he had no suicidal thoughts. His psychomotor behaviour was restless with stereotyped repetitive movements. He had limited insight into his hoarding behaviour. The patient met all DSM-5 criteria of hoarding disorder for his object hoarding (table 1). We compared the digital hoarding of this patient to the DSM-5 criteria of hoarding disorder and noted a lot of similarities. The patient had difficulty discarding his digital pictures even though they were of limited value. Furthermore, he had stored multiple pictures of the same scene and never inspected them again. He believed these pictures could be of use to him in the future. Moreover, the amount of pictures made it impossible for him to process them on his computer, hence the eight external hard drives. Therefore, this ‘digital’ cluttering led to disorganisation of the digital pictures and accumulation of digital storage space, which is functionally similar to the ‘accumulation of possessions’ in object hoarding. The patient experienced significant distress because of his digital hoarding. The digital hoarding was not preceded by specific obsessions, nor did the patient suffer from other obsessions. The patient did not feel forced to perform this behaviour and it was not directed at any perceived prevention. Therefore, we did not classify his digital hoarding as a symptom dimension of OCD. Furthermore, the patient did not meet criteria for obsessive-compulsive personality disorder (OCPD) apart from his hoarding. We considered the option of his digital hoarding being part of his ASD. Pertusa et al10 stated hoarding behaviour in ASD might be part of a stereotyped interest with related collecting of items. The digital hoarding of our patient could be seen as part of a stereotyped interest in digital photography in the scope of his ASD. However, the processing and saving of the digital pictures caused suffering and distress, and thus was less likely to be part of his stereotyped interest. He claimed he would enjoy his digital photography more without the need to organise and discard the pictures. Furthermore, patients with ASD have problems in executive functions such as planning and organising, which could be the reason for his disorganised digital hoarding. However, the disorganisation of his digital pictures was not solely due to a lack of overview, but mainly a consequence of massive accumulation. Therefore, we did not categorise his digital hoarding as part of his ASD. Apart from the ASD, this patient was also diagnosed with traits of ADD. Individuals with childhood attention deficit hyperactivity disorder (ADHD) symptoms have a higher prevalence of lifetime hoarding symptoms as compared to individuals without childhood ADHD (8.9% vs 2.7%).11 Inattention in ADHD is an especially strong predictor of hoarding-related behaviour.12 Also, patients with hoarding disorder show an increased rate of ADHD symptoms compared to healthy controls. Nearly 30% of hoarding patients fulfil the inattention criteria for adult ADHD.13 Part of this patient's inability to organise his objects and digital pictures could be attributed to his inattention span and lack of overview due to ADD. However, hoarding disorder itself may lead to impaired cognitive functioning, especially inattention and indecisiveness, contributing to disorganisation.14 ,15 Furthermore, the disorganisation is also due to massive accumulation. Therefore, the disorganisation in his collection of objects and digital pictures is better explained as a consequence of his hoarding disorder rather than as a consequence of his ADD traits. All in all, certain aspects of his digital hoarding, including the lack of overview and disorganisation of his digital pictures could be partly attributed to his ASD and ADD traits. However, his digital hoarding fulfilled all DSM-5 criteria for hoarding disorder. This justified a separate diagnosis of hoarding disorder alongside to his ASD and ADD traits. Object hoarding is mainly treated with cognitive–behavioural treatment (CBT), including motivational interviewing, stimulus control, finding alternative activities and challenging dysfunctional thoughts.16 We suggest a comparable treatment strategy for digital hoarding. In the case of our patient, we would first apply motivational interviewing for encouragement in the treatment of his digital hoarding, followed by reducing the acquirement of photos. For example, by setting a maximum number of pictures to be taken of a scene, and to search for alternative activities related to digital photography. Finally, his thoughts about storing pictures for future use could be challenged. Ideally, part of this treatment would be performed at the patient’s home by home care workers instructed by an experienced cognitive–behavioural therapist. The patient is currently being treated with CBT by a therapist from our psychiatry department, in collaboration with his attending psychiatric nurse. 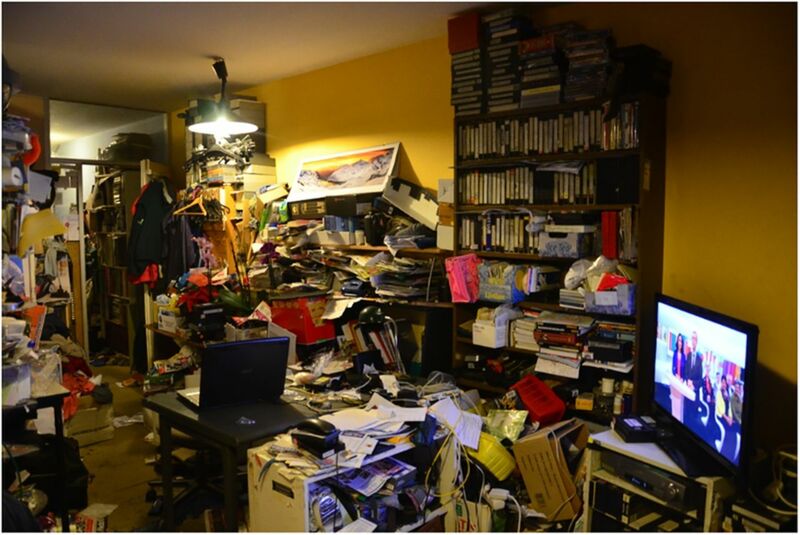 The first priority is treatment of his object hoarding because of the enormous cluttering of his house. So far, the patient has organised a large amount of his objects in a wall cabinet. He is satisfied with the extra floor space gained and this encourages him to keep going. The next focus will be on decreasing the acquirement, and the discarding of objects. The treatment progresses slowly because the patient wants to maintain full control over the treatment. The reduction of digital hoarding has recently been included in his treatment, starting with organising his pictures based on subject and deleting pictures of lesser quality. We presented a patient who, apart from object hoarding, suffered from digital hoarding. The accumulation and disorganisation of his digital pictures resulted in distress and impairment of functioning. The features of his digital hoarding showed a similar pattern to his object hoarding. No scientific papers on digital hoarding have been documented up to now. Digital hoarding is described as a new concept in online blogs or magazines, which mainly contain calls for help or ‘confessions’ from possible digital hoarders. On these websites, digital hoarding is defined as a more hidden subtype of hoarding, because it does not interfere with living spaces and hygiene. It is considered a solitary problem and not necessarily existing alongside other forms of hoarding. The unrestricted possibilities for saving and the fear of losing important data is leading to disorganisation and loss of perspective, so-called digital cluttering. Digital hoarding is pathological when it crosses the line of interference with other aspects of life. No university or hospital websites have addressed the problem or offered professional treatment. A few clinical psychologists claim treatment in the form of behavioural therapy focusing on distraction by other activities, building on social skills and improving sleep hygiene.17 Technology companies have reacted to the phenomenon by offering tools and software for archiving and filing computer files.18 However, the possibility of saving more files might stop any tendency to actually delete files to gain more overview of data. Digital hoarding could be treated based on the principles of CBT for object hoarding. I am proud to be the first patient in whom digital hoarding is described in the scientific literature. I hope this will be of help in the future to other patients with problems of digital hoarding. We suggest digital hoarding, characterised by the accumulation and disorganisation of digital files causing distress and impairment in functioning, as a new subtype of hoarding disorder. Digital hoarding might be less obvious than other subtypes of hoarding and, to detect, requires a perceptive attitude from caregivers. More case reports and clinical trials are necessary to gain further insight into the phenomenology and optimal treatment strategy of digital hoarding. The authors would like to acknowledge Ron de Joode, therapist at our department, for his involvement in the treatment. American Psychiatric Association. Diagnostic and Statistical Manual of Mental Disorders. 5th edn. Arlington V, ed. American Psychiatric Publishing, 2013. Contributors MJVB identified the case. All the authors contributed to the conception, design and draft of the manuscript. All the authors revised the manuscript critically for important intellectual content. DD takes responsibility for the integrity of the data. All the authors gave their final approval of the version to be published.